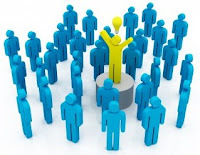 No doubt your firm has principals and other managers who are regarded as leaders. Whether they actually function as leaders has relatively little to do with their position. Recognition as a true leader is earned, not bestowed by appointment. A leader is one who engages the willing involvement of others in creating positive change. A leader may have positional authority, but getting people to follow depends far more on influence than compulsion. Indeed, the real power in getting things done successfully in an organization lies with the doers, not the leader. They ultimately control how well the job is performed. I explored this dynamic in an earlier post: "Why Negative Reinforcement Seems to Work." A manager can, of course, exert his or her authority in telling employees what to do. Implicit in that authority is negative reinforcement, the threat of an unfavorable consequence should the employee fail to comply. So the task is done mostly because the employee has to. But the quality of such "compliant effort" will never equal what could be accomplished through the influence of an effective leader. A leader understands how to use positive reinforcement to draw out "discretionary effort" from employees--meaning effort beyond what is required or demanded. Discretionary effort is a gift from an employee to the firm, given because the employee wants to. Do you lead primarily by personal power or positional power? You could answer that question based on your intent. But a better way is to look at the results. What percentage of the people who work under you regularly demonstrate discretionary effort? (Don't just look at the willingness to work long hours, but attributes such as initiative, innovation, service.) To what degree do they meet and exceed your expectations? To further judge your personal power as a leader, you might consider the self-assessment below. I use this in my leadership workshops to help participants think about their "personal credibility," which relates to how worthy they are of others' trust and respect. Answer the following questions based on how you think your coworkers would respond. Use a scale from 5 (always) to 1 (seldom). You tell the truth even when it's not in your best interest. When you tell someone you'll do something, you follow through. You keep the deadlines you agreed on with coworkers and clients alike. When you ask your staff to make extra commitments, you model the same. If you lack competency where it might be expected, you're not afraid to admit it. When you are to blame for a recognized problem, you publicly take responsibility for it. You live by the values and priorities you espouse to others. When you have a problem with a coworker, you listen before criticizing. You show genuine interest in your staff as people, not just workers. You praise your staff's achievements, not taking undue credit for them yourself. You refrain from disparaging coworkers to others behind their back. You can disagree with a coworker without belittling motives or character. Even when busy, you make time for coworkers when they need it. You characteristically project a positive, enthusiastic attitude about your work. When you share opinions, people respect them because of your demonstrated expertise. How your colleagues would answer these questions goes a long way toward determining your personal power. One final point: I don't mean to suggest that exercising positional power is never appropriate. It is in many circumstances, especially in setting boundaries for what will or won't be tolerated in the organization. For example, you should not allow anyone to willfully violate your firm's values. Doing so effectively invalidates those values. But show me a "leader" who relies predominantly on the use of positional power and its implied (or explicit) negative reinforcement, and I'll show you someone unworthy of the title. Leaders bring out the best in people, and you never accomplish that by compulsion.